Call forth praise from the youth of your assembly with the first ever Catholic music resource designed for middle schoolers. This assembly edition features choral parts for the album Never Too Young: Spirit & Song for Young People. This accompaniment features keyboard and vocals for the album Never Too Young: Spirit & Song for Young People. This accompaniment features guitar and vocals for the album Never Too Young: Spirit & Song for Young People. This 12-CD collection features words and music for 280 contemporary songs for use in prayer, liturgy and the classroom. This 12-CD collection features instrumental versions of 280 contemporary songs for use in prayer, liturgy and the classroom. This 24-CD collection features words and music as well as instrumental versions of 280 contemporary songs for use in prayer, liturgy and the classroom. This softcover book by Mark Friedman and Janet Vogt features a comprehensive guide to help teachers, catechists and music directors. Offering more than 280 contemporary songs for use in prayer, liturgy and the classroom, Never Too Young is just right for children in fourth through eighth grade. All songs have been carefully selected to fit the particular voices, musical skills and catechetical needs of youth. The assembly songbook is easy to use and encourages young people to sing with one voice, helping you brighten your prayer services, liturgies, catechetical classes and more with contemporary music. Music has always been one of the best ways to teach the faith, and this collection has been meticulously crafted to be challenging enough to engross your students, yet fun and exciting as well. 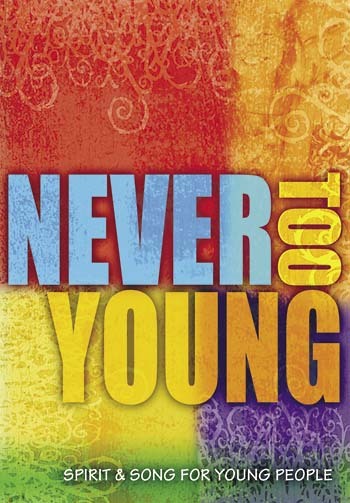 Featuring a variety of contemporary styles, including pop, rock and gospel from some of the best-known composers of contemporary and children's music in the Church today, Never Too Young includes music from Steve Angrisano, Tom Booth, Mark Friedman, Sarah Hart, Carey Landry, Jesse Manibusan, Janet Vogt, Christopher Walker and more. The comprehensive leader’s guide, written by popular children's music composers Mark Friedman and Janet Vogt, helps teachers, catechists and music directors make the most of this collection with practical wisdom, ingenious tips and creative activities. Starting with the opening of the school year, the book follows the academic and liturgical years, covering the most important Church seasons and feasts and special school-related events like Catholic Schools week and graduation. It closes with general themes like Marian feasts, first Eucharist and confirmation. Featuring full vocal and instrumental recordings of all the songs in this collection, the 24-CD set will help you optimize your rehearsal time and learn the songs quickly and easily, letting you implement them more effectively in prayer, liturgy and the classroom.